The seniors at PCA&D are immersed in the creation of their senior theses, the culmination of their BFA degree. Each senior has his or her own studio space at PCA&D in which they create his or her thesis, which will be exhibited during the Senior Show and Celebration, Friday May 6, 5-8 p.m.
As the senior theses evolve, so do the Senior Studios, showcasing each artists's individuality and personality. Here are a look at the studios of four Fine Art Seniors, Casey Clark, Paige Thoman, Nicole Hittner and Vanessa Clough as they work on their theses. Casey Clark: My artwork involves using repetitive mark making as a meditative process to bring out subconscious imagery. A lot of forms I utilize are based off of internal organ structures to mirror my theme of externalizing my internal thoughts and feelings. Paige Thoman: I am a senior fine artist. I am working on a series of work dealing with depression, living with it and coping with it. I primarily work using text, either hand lettering or digitally projecting it for me to trace. I prefer to work using acrylic and most recently with spray paint on canvas and paper on wood panel. Nicole Hittner: I am securing and cementing my history and my present day experiences through intricate collage. "Heirlooms" focuses on playful and whimsical portraits of my family members reimagined in my own style with cut paper. The artworks have now branched out to include pieces displaying jewelry passed through the generations of my family that are rich with sentimental values. Vanessa Clough: My work has themes of home, psychology, and personal experience. I look to making art as a way of expressing emotions that can’t be expressed with words, in turn making my own personal visual language. Through the use of piles of clothing, sewn organic forms, and domestic themes, I am creating an environment that symbolizes the home, comfort vs. discomfort, and psychological distress. I’m exploring the idea that homes act as receptacles of our memories, thoughts, and emotions and how our material items reflect who we are and who we want to be. 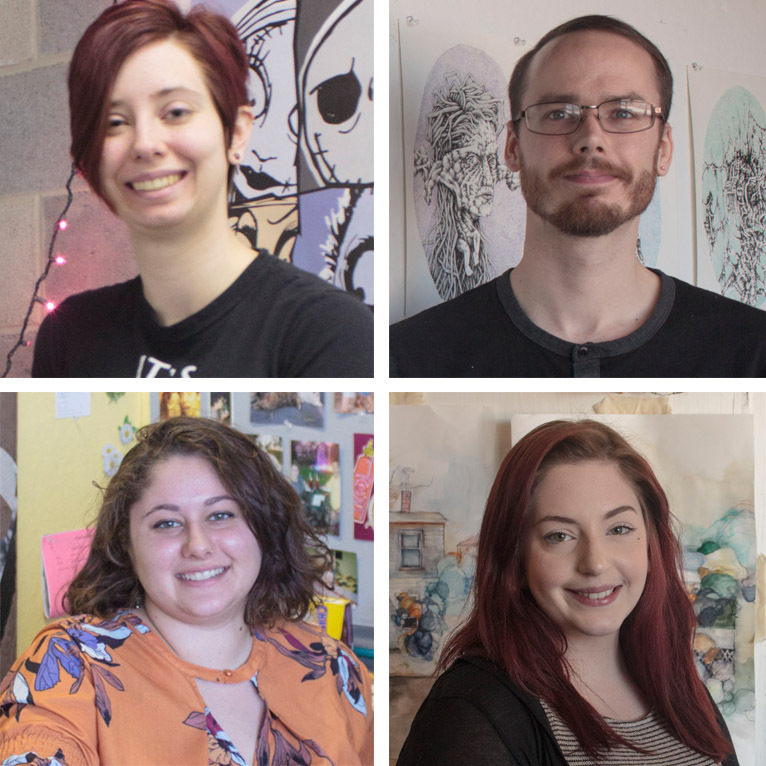 Check out an earlier blog post Personalities in the Studio to see the fine art studios of Alexandria Bonner, Jason Herr, Erich Bell, and Alexis Supplee. Follow the blog for additional looks into the Senior Studios, as the Class of 2016 perpares for commencement and the Senior Show and Celebration. Mark your calendar for Friday May 6 for the Senior Show and Celebration! Photos in these slide shows by Trayton Pinson, PCA&D Photography '16.